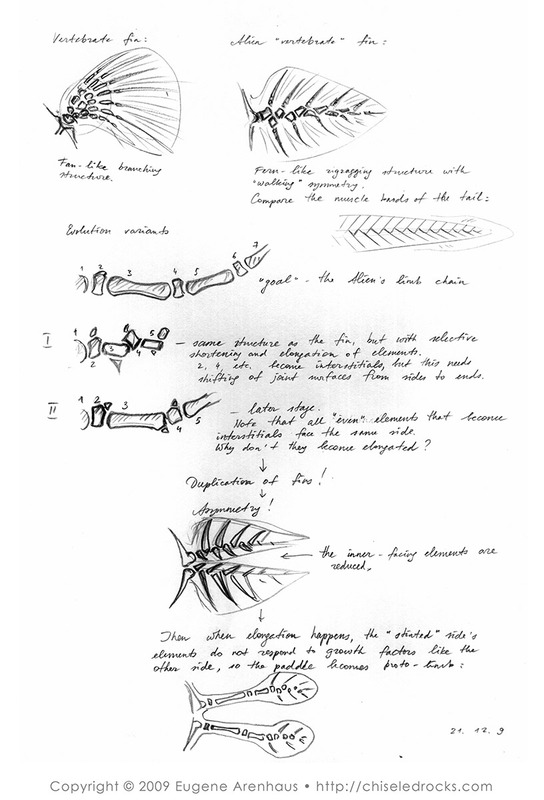 The second page of brainstorming the gracile alien’s limb evolution yields a more interesting concept. Again, there is a fin of an Earth’s fish for comparison, and an alternating zigzag structure for the gracile alien’s piscine relative’s paddle that I’ll end up using. Some thought is given to the fate of the rays as the fin becomes a chain of jointed bones, and the idea of paired mirrored paddles makes an appearance. All this wants is a radical breach of symmetry that happened in the 4th phase of the brainstorm.